This project was done in collaboration with Mariona Omedes from Nueve Ojos, produced by Media Pro and directed by Manuel Huerga. The documentary is a walk through the city of Barcelona in 3D, carried out in a single plane sequence. An immersive experience where the music, the three-dimensional sound and the narrator, a different one for each language, are protagonists too. Here you can watch the trailer. This project was done in collaboration with Mariona Omedes from Nueve Ojos, produced by Media Pro and directed by Manuel Huerga. The documentary is a walk through the city of Barcelona in 3D, carried out in a single plane sequence. An immersive experience where the music, the three-dimensional sound and the narrator, a different one for each language, are protagonists too. Here you can watch the trailer. 1/Design of the documentary logo for the communication campaign. 2/Design of a custom alphabet to complement the logo but also for the main credit titles (as director, the narrator, producer, etc.). 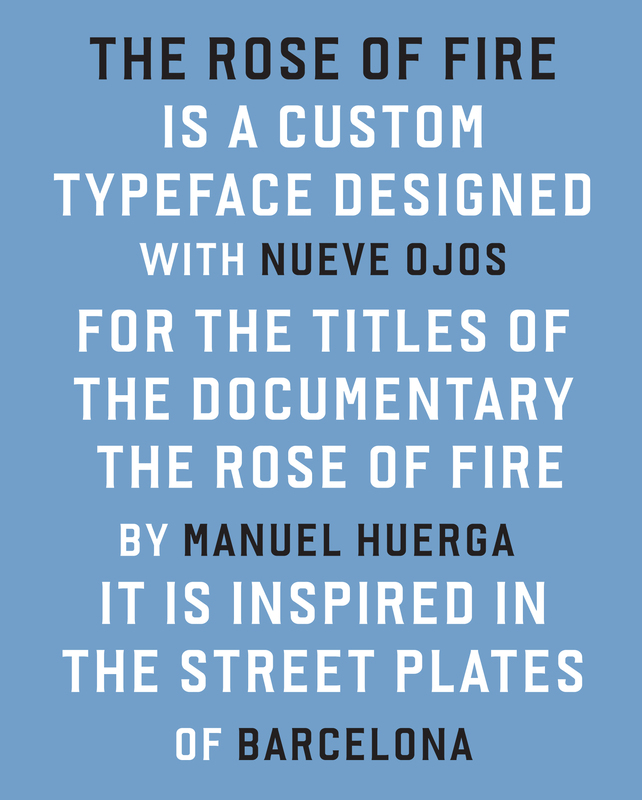 The goal and brief were to create a type that could represent Barcelona. The logotype design is based on the combination of handwriting (done by Mariona and retouched by me) and the custom typeface. Together they perform in a very dynamic way. 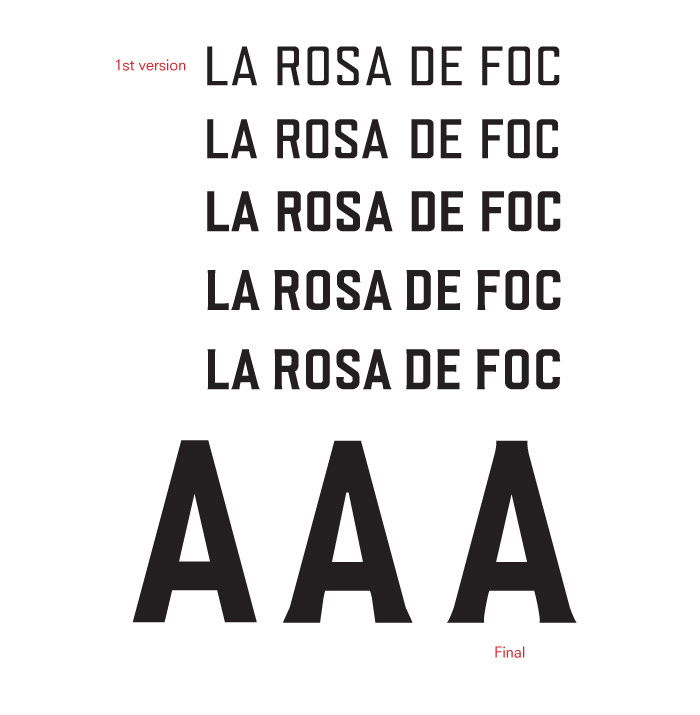 “Rosa de Foc”, the custom typeface. The concept of the custom typeface is based on the answer to this question: “Which would be the typeface that best represents the city of Barcelona? That’s a difficult question because Barcelona doesn’t have such a strong and clear typographic identity. The idea came after watching some trailers of the 3D movie, where you can easily see that the streets of Barcelona have a main role. 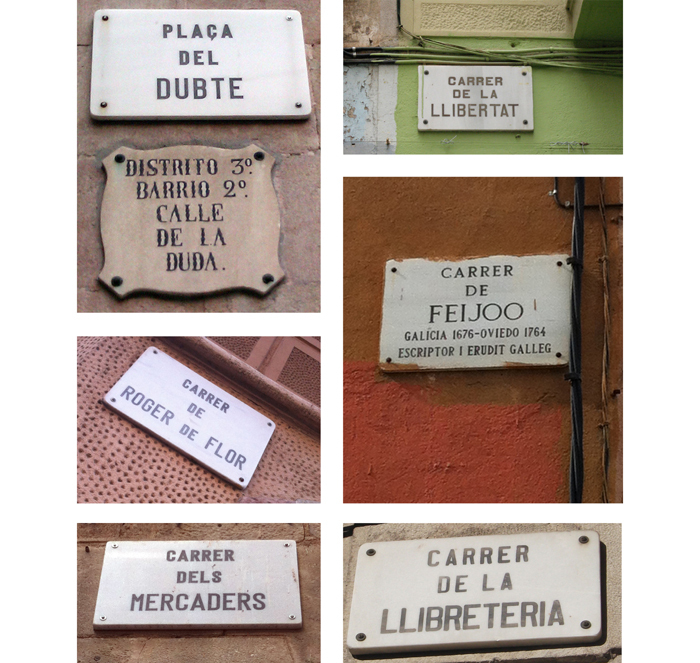 When observing the architectural details, and especially the street signs, there is not only one typeface but the geometrical condensed sans serif is dominant. The first sketches served to test weight, spacing, and legibility, for paper and screen. The final version is an only Capitals incise sans serif typeface with some stylistic details that mostly appear when used as Display, but functional and extremely legible in the credit titles. That’s the definitive version. The typeface was used for the posters and the main credit titles, that were also designed by me. Here you can see how with one single typeface, but using different sizes, I achieved a recognisable identity.